Los Angeles Water Heater Service | Water Heaters Only, Inc.
At Water Heaters Only, Inc we answer our phones 24 hours a day, 7 days a week, 365 days a year. When your water heater fails we are here to help. 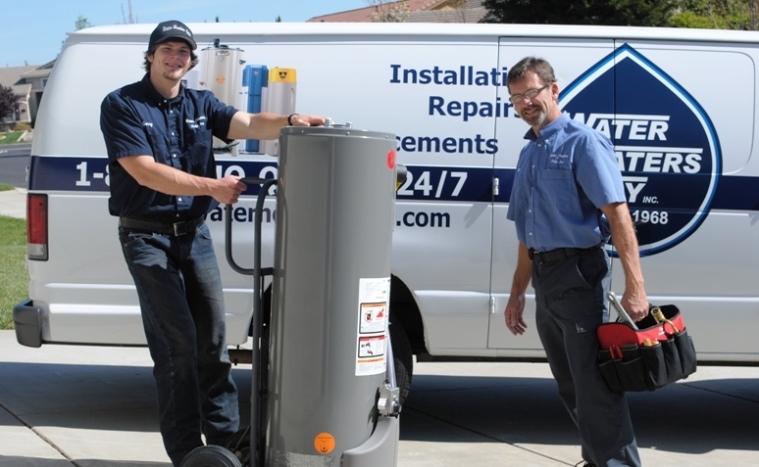 A Water Heaters Only, Inc expert can help walk you through turn off a leaking water heater and schedule an appointment to get our technician onsite quickly to provide Los Angeles water heater service, this includes a simple water heater repair or a complete water heater replacement. We have been specializing in installations since 1968! If you have a residential water heater, a tankless water heater or a commercial water heater that is not working, we can help. Water Heaters Only, Inc has been specializing in water heaters since 1968 and we work on both gas or electric models. Our technicians arrive in a van stocked with parts and water heaters to solve most water heater issues on site. No one likes a cold shower so we do our best to show up and quickly get the job done in a timely manner. This saves both time and money for our customers and helps us keep our costs competitive. Running out of hot water is not something anyone wants to go through, with over 51 years of experience we understand how important it is to offer quick service and quality products. Call our water heater experts 24 hours a day 7 days a week 323-234-7071. We can help answer questions you have about your water heater or schedule an appointment for quick Los Angeles water heater service. Read our reviews to learn why customers rate us 5 stars, we’re reviewed on Angie’s List, Yelp, Google and Facebook. You can also browse photos of our most recent water heater installations on our Facebook page and see us in action.